Create wonderfully, warm and lively Mexican and Southwestern dishes with this fiery blend of various chiles, oregano, cumin, onion, and paprika. Mix 3 Tbsp seasoning with 2 Tbsp olive oil and 1/4 cup lime juice for a tasty marinade for grilled salmon and shrimp. Wonderful in salsas, and tomato sauces. 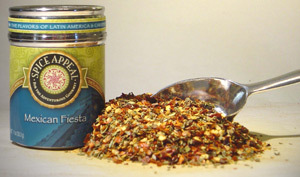 Use to flavor enchiladas, tamales, tacos, and other Tex-Mex dishes. Add to potatoes dishes or hamburgers for that extra zest. Sprinkle over pasta, pizza, and salads for that south-of-the-border flavor.